A beautiful Spring decoration for some forsythia branches for example, are these five Maileg Metal Bunnies. Three of the bunnies are sitting on their hind legs and two are sitting on all fours and they are each hanging from a lace ribbon. 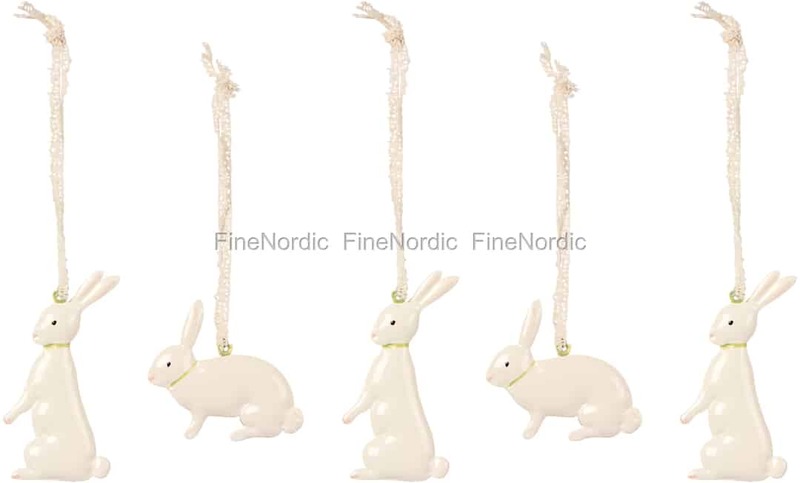 These pretty Easter ornaments have some charming hand painted details on them. You can also let them dangle from a candleholder, an Easter wreath, a hook or a handle. 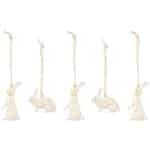 This 5-piece set of Maileg metal bunnies comes in a nice gift box. If you will keep the set for yourself, you can use the box to store the bunnies in when you are not displaying them, or if give it away as a gift, then the box serves as a pretty gift box. Keep them or give them away? This tough decision is yours alone to make!